I was surfing around the Internet today and stumbled across an old website I created at least 10 years ago on Yahoo’s Geocities. The web hosting site went defunct several years ago and I assumed my site was lost. Then I found it a year or so later. It had been captured by a web crawling service and archived. Now the site’s turned up again! It’s on Bravenet, a web hosting service. When I created the site, I used a free guestbook powered by Bravenet. I guess that gave them the right to save my site. That’s ok, I like seeing it again. Unfortunately, I can’t access the site to manage it. In order to get customer support from Bravenet you have to pay $100 per year. I’ve posted a question looking for help from Bravenet members on how to reactive my site, but I don’t hold out much hope. I’m not sure the site is worth $100 per year. But, it was fun to create. My first venture into World Wide Web land. Here is the first page of the site. It appears the links inside the webpage also work! Welcome to Phoenix Farm, our home in Central Maine. The farm was started in 1969 and was originally part of a larger farm. The stone walls have trees growing through them that are at least 150 years old, probably older. This land has some of the best plant growing soil found in Maine.The farm covers 75 acres of fields and woods on the southeast side of a small hill. At the base of the hill a little river called Martin Stream passes through the farm. There is a maple orchard on the north side of the farm. Two fields were planted to apple orchards. Over the years many of the trees have died, whittling the orchards down from 800 trees to about 200. A small vineyard of purple, red and white grapes grows near the house. Just north of the house is a home orchard of sour cherry and pear trees. Below this orchard is a patch of 400 highbush blueberry plants.The barn lies downhill and to the north of the house. Directly downhill from the house is a 50’X 50’garden space. 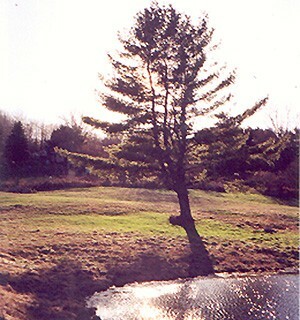 Pastures and a half-acre farm pond fill the long plateau below the garden. South of the pond, beyond an ancient tree-lined stone wall is a large hayfield. From there the land drops down into woodlands that run along both sides of Martin Stream. From the farm a panorama opens across a valley of fields and forests to an opposing ridge of trees, fields and scattered homes a mile away. Some of the produce from Phoenix Farm includes: pure maple syrup, organic apples, pears, sour cherries, grapes and highbush blueberries, jams and jellies, garden vegetables, autumn decorations like gourds and indian corn, hay, firewood, beef, angora rabbits, angora fiber and yarn, araucana and ameraucana chickens and blue eggs. And wealth beyond the treasure of kings. Not sure why the fonts change in the body, must be something to do with the way I wrote the program or who knows. I learned how to write in basic html when I created this site. A real stroll down memory lane! With the outside temperature around 10 degrees F, a chill begins to settle in the bones. The best way I’ve found to dispel the cold is a bowl or two of piping warm fish chowder. 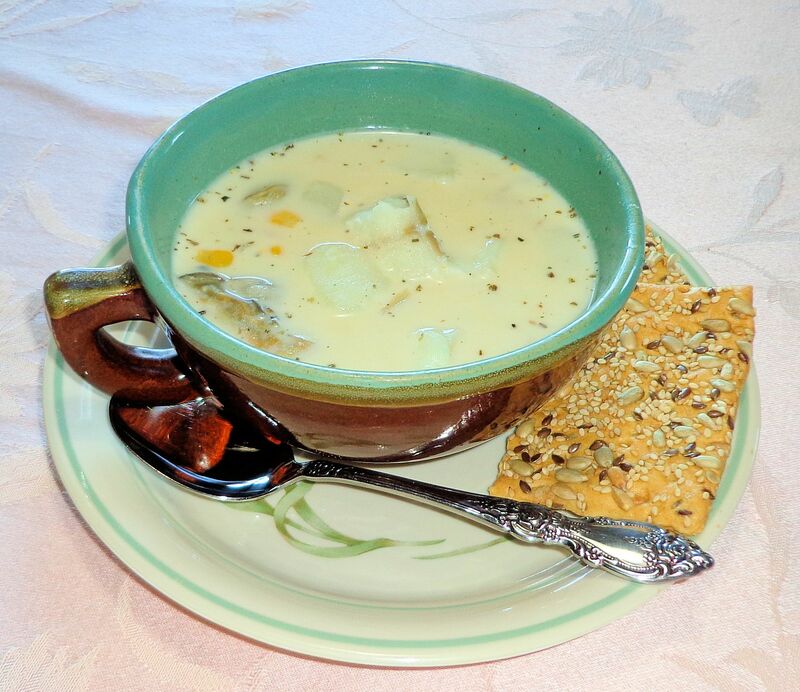 There are many variations on the New England chowder recipe. Any fish will work. I’ve used haddock, pollock, cod, salmon, even some pickerel I caught ice fishing. Also good are shellfish like clams, mussels or oysters. Once I shelled a bunch of tiny periwinkles picked from the rocks by the sea, they were delicious. More important than the species used is that there is plenty so the chowder is full of fish. The basic ingredients are potatoes, onions, some form of fat, fish and milk. Some use salt pork or butter, I prefer bacon. Most New Englanders like their chowder thick and creamy. They use full cream, half and half, or my choice, evaporated milk. Some use plain milk. The cooked potatoes help to thicken the broth, as does creamed corn, flour can also be added. This is my personal recipe, one I’ve made dozens of times. It never fails to warm my bones on a freezing day. In 4 qt stock or sauce pan on medium heat, cook bacon until fat runs, cut bacon into small pieces and add onions. Heat, stirring, until the onions begin to brown. Add the water, herbs and potatoes. Cover and cook about 8 minutes until potatoes start to tenderize. Stir in corn and fish. Cover and simmer 8-10 minutes until fish is cooked. Gently stir in milk, cover and simmer until heated through. Serve hot with crisp bread or crackers. Makes about 2 quarts. 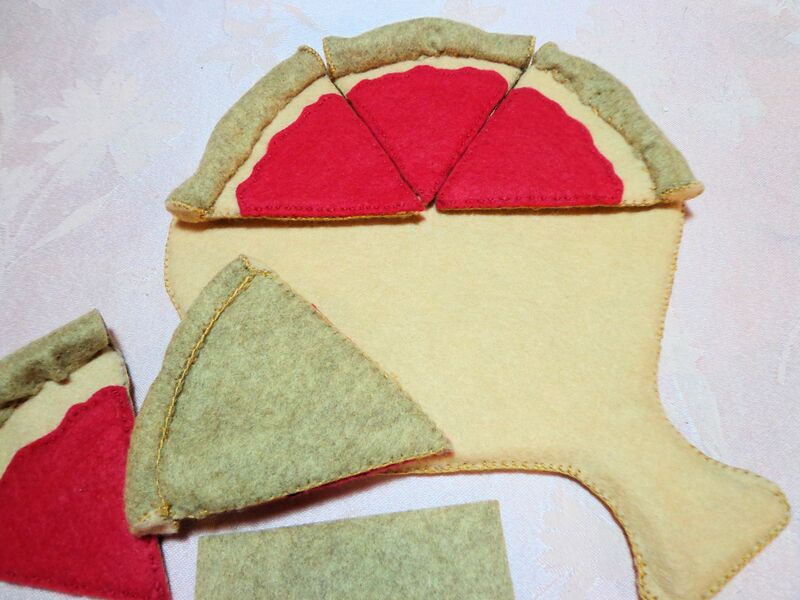 For my granddaughter Lia’s third birthday I’m making pizza from felt to go with her kitchen set. Last year I made bread, sandwich fillings, fried eggs and bacon. 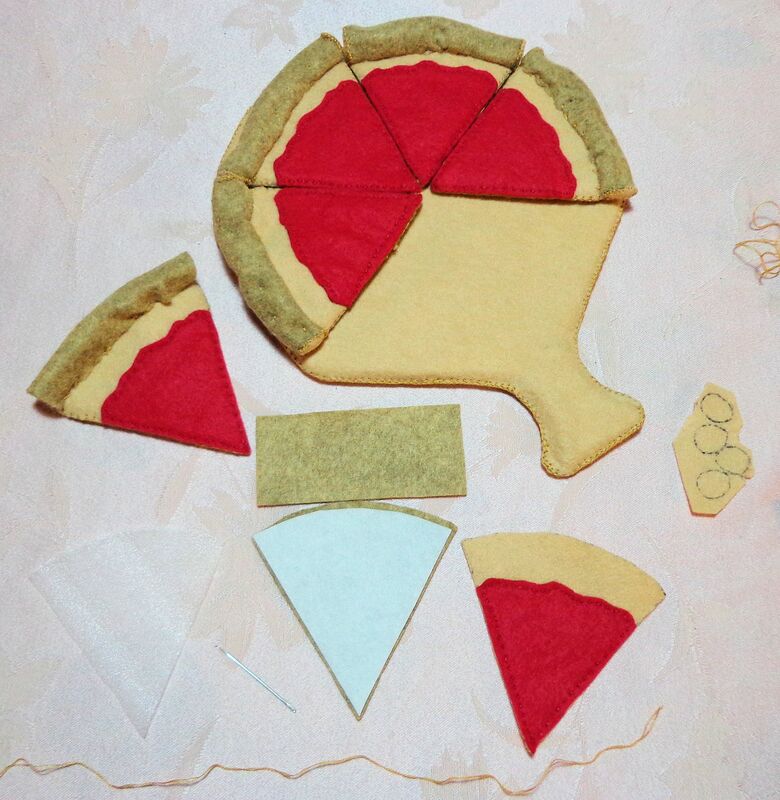 These approximately one-half real size play foods are made from patterns designed by Sweet Emma Jean, a store on Etsy. The patterns and bundles of felt for each set are available for purchase. These are to be made for personal use and not for resale. Since all the work is hand-done, I would have to charge much more than most would be willing to pay to be compensated for the time it takes to cut out and stitch the pieces. Even though it takes time and effort, making the play food is fun. Lia loves the things her mother and I have already made for her and plays with them all the time. I’m pretty sure she will enjoy the pizza set since pizza is one of her favorite foods. So far for the pizza, I have finished the board and five pieces of pie. 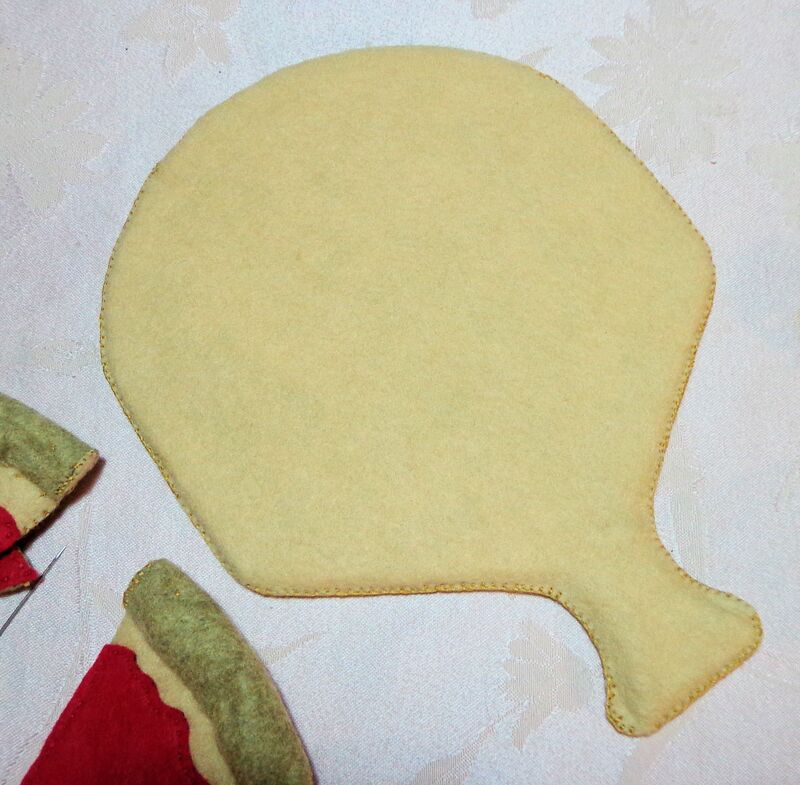 The slices consist of a bottom crust with dimpled rolled edge for a hand-tossed look, a top crust with attached sauce and two inner layers, one of stiff felt and one of foam, to thicken the slice. 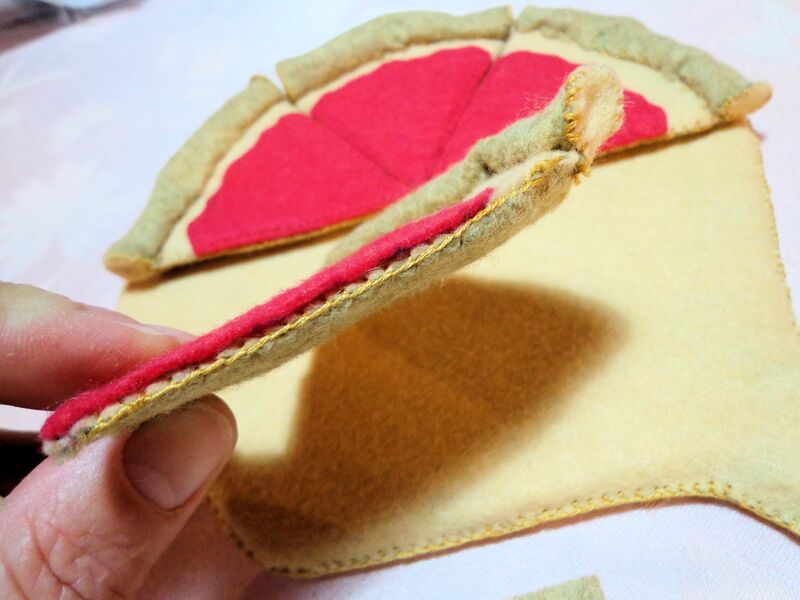 The sauce is stitched on to the top crust, the edge is attached, stuffed with a little fiber fill and sewn down and the two crusts are secured together with blanket stitches. 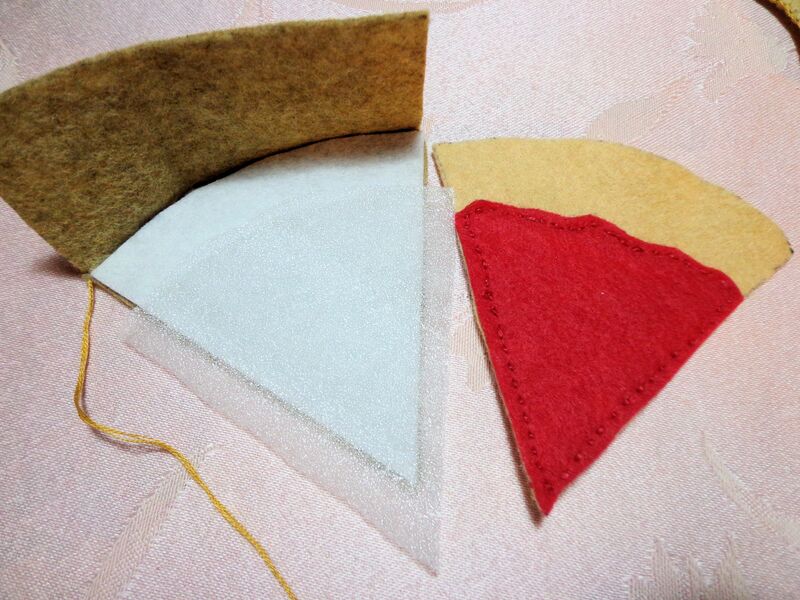 The ends of each crust have a little cap sewn on. I will even be making a little pizza cutter that actually rolls! My hands do get tired after an hour or two of sewing. Luckily, I still have plenty of time to complete this set, including all the toppings. Lia’s birthday is a couple months away still. 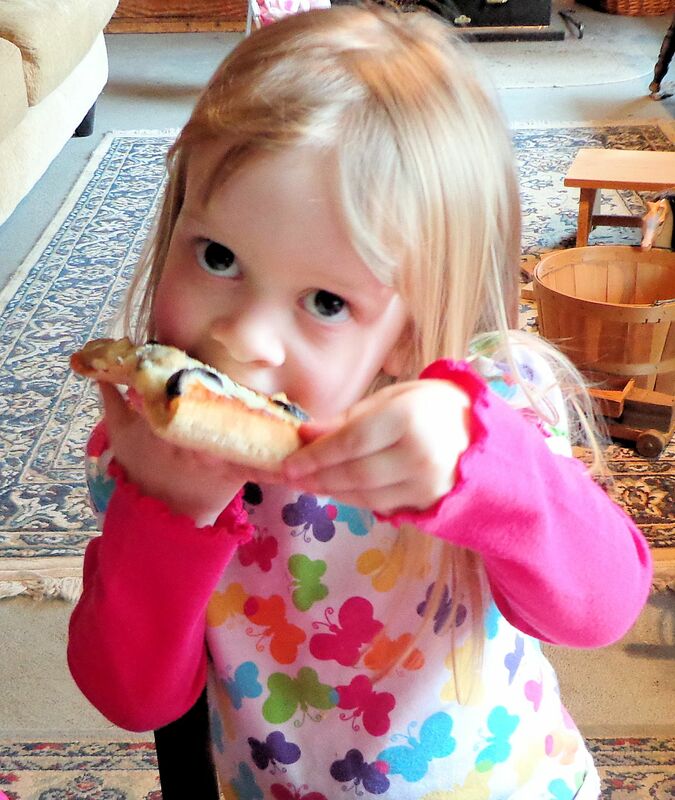 I look forward to sharing several pieces of felt pizza with Lia. Make mine with cheese, mushrooms, black olives and green peppers! 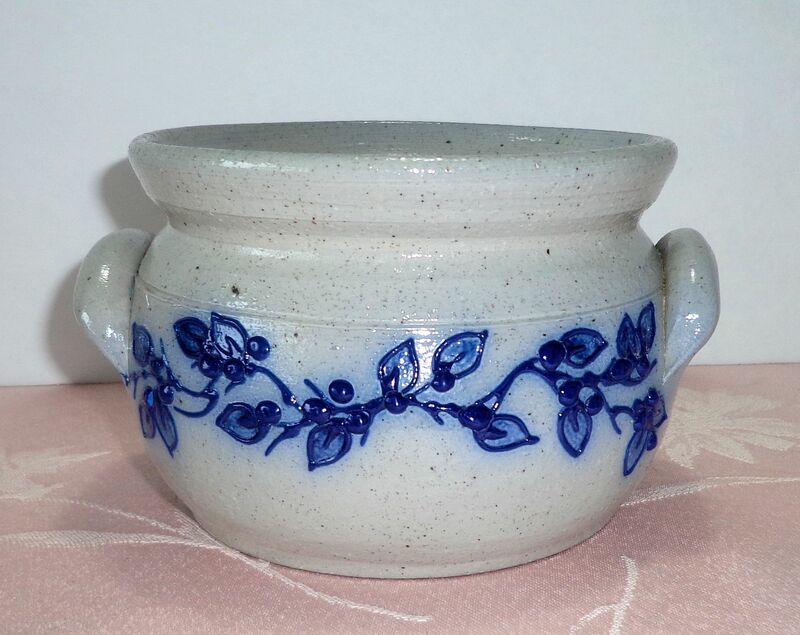 The first piece of Salmon Falls salt-glaze stoneware I ever saw was in the Berry Vine pattern, above. I fell in love with the design. Being a hopeless collector of pottery, it was inevitable my collection of Salmon Falls would grow. Without really trying, my set has increased to eight pieces. These show some of the variation that has occurred over the years of production. 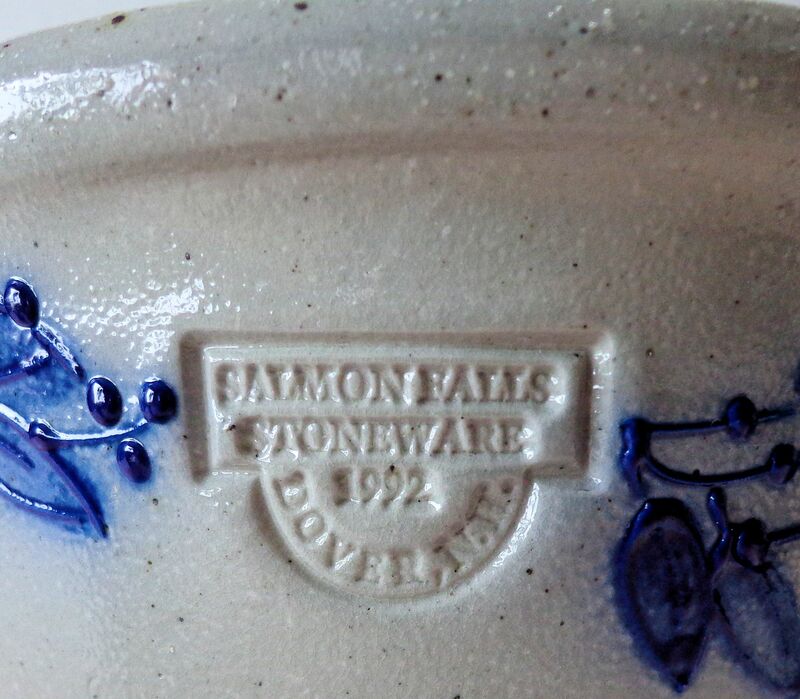 Salmon Falls Stoneware is located on Oak St in Dover, NH. 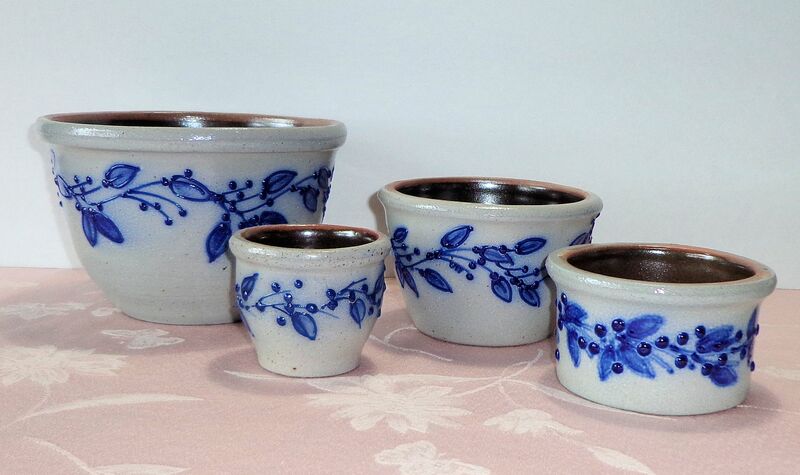 The potter began his studios in the early 1980s, moving to the current location in 1986. I have been to the pottery in the old railway engine house and it is amazing. 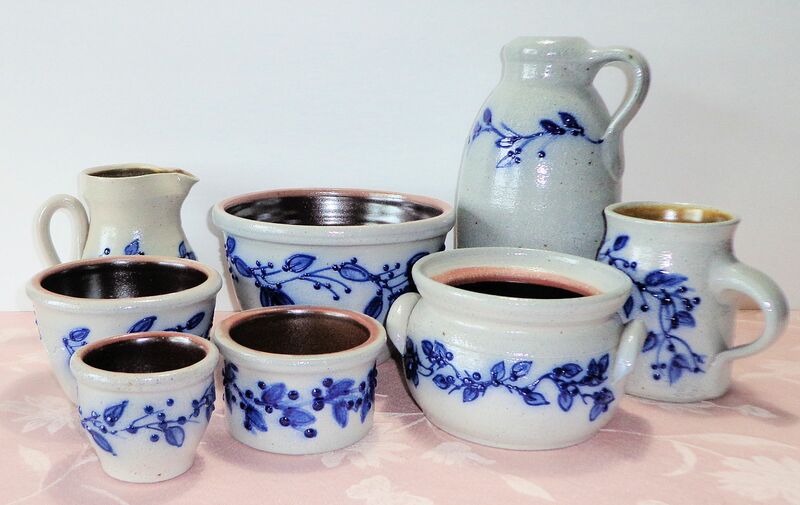 What started as one man’s dream has grown into a respected and well-loved producer of beautiful ware. Salt-glaze is my favorite finish. 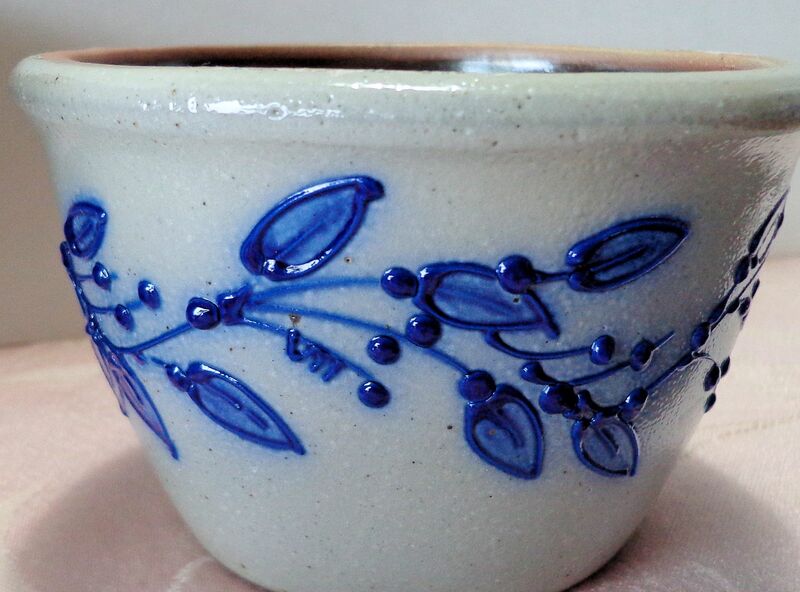 It is achieved by throwing salt in the hot kiln with the greenware. 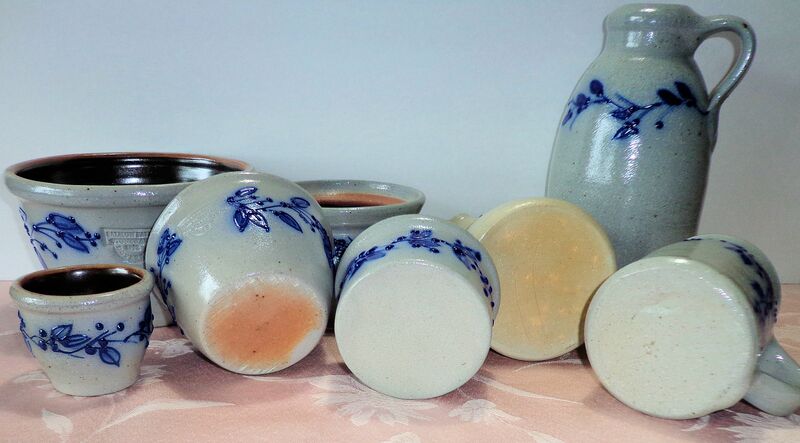 The resulting glaze is shiny and hard with a characteristic bumpy texture. The decoration is handpainted so the design varies slightly with the artist. 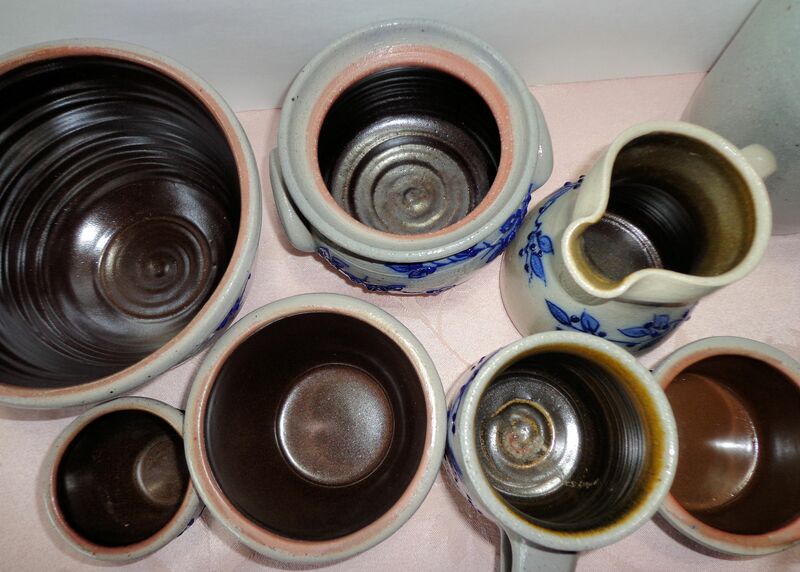 The minor variations in bisque color are due to differences in clay. The more modern pieces have a better defined design that is less likely to bleed and the interior finish is a reddish-brown. Older pieces have a yellow-green tint to the interior. The maker’s mark has also changed, an older mark on my mug is shaped like the sun on the horizon. 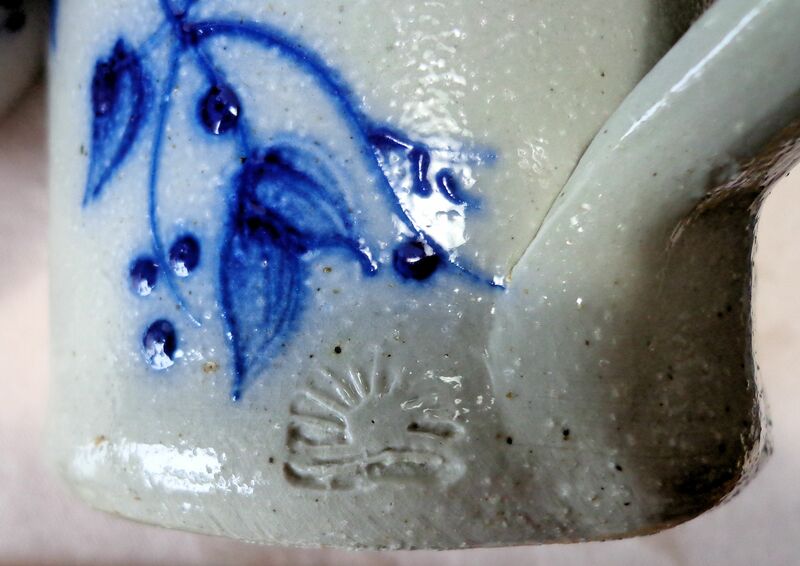 The current mark is always stamped on the side of the piece. 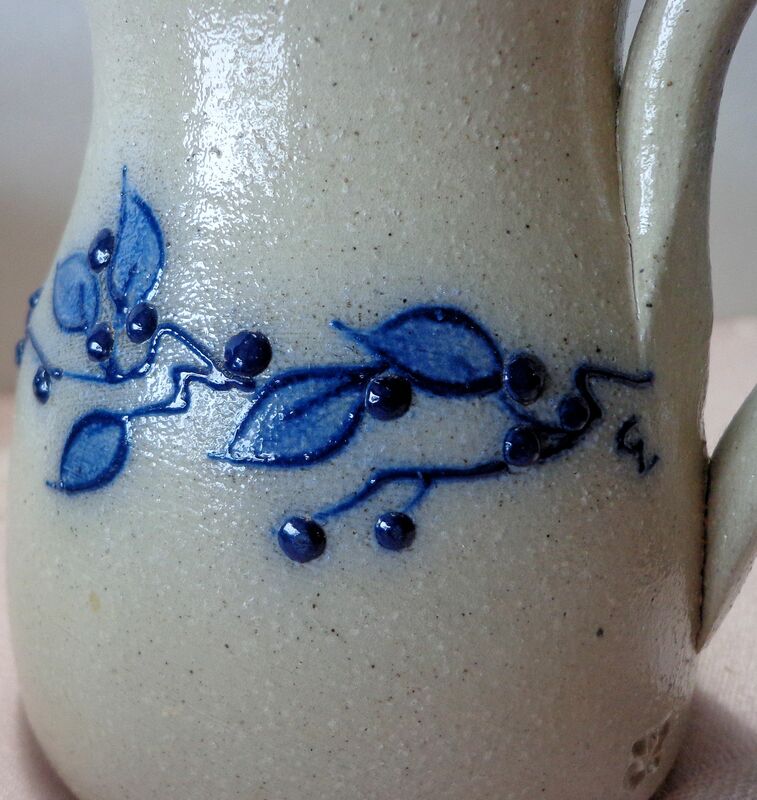 The pottery lists several patterns. I have settled on Berry Vine, though others such as Cranberry, Dragonfly and Wildflower catch my eye. There is a range of forms for many uses including tableware, serving ware, baking and lighting. I have a few from different categories including some discontinued forms. My favorite is the dinner mug, if I owned more than one I’d use the mug. Since there is only one, I keep it for display. Always, I’m on the lookout for another mug. I have two sizes of bowls, a small crock and a custard cup. 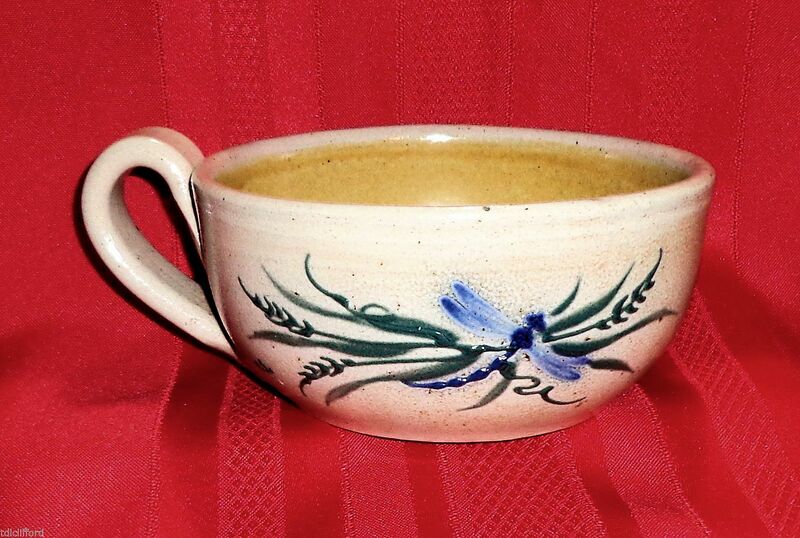 The cup was purchased at the pottery and sometimes I use it as a votive or to serve nuts. The small casserole was a thrift-shop find and is missing the lid. 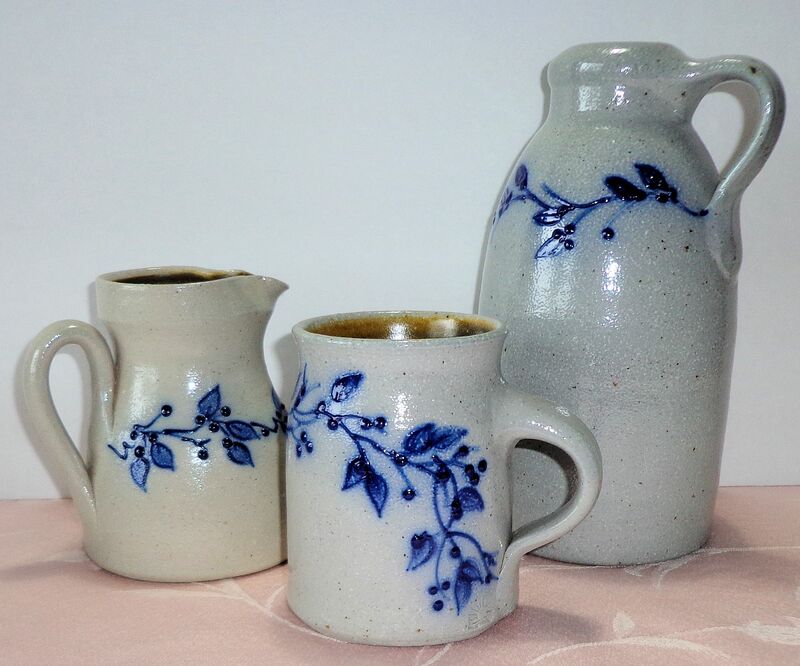 The creamer is an older piece marked with the artist’s inscribed initials and the pitcher is discontinued. The pitcher is 8.5″ tall and the largest bowl, I believe it is 1.5 qt size, has a 6.5″ top diameter. Recently I found, and just sold, a piece of the Dragonfly pattern. Called a chowder cup, it measures 5 3/8″ across and holds 2 cups. I was sorely temped to keep this piece, but common sense won. There is just not enough room in my display cabinet for another Salmon Falls pattern. To disable the website music, click the controller near the bottom of the page. 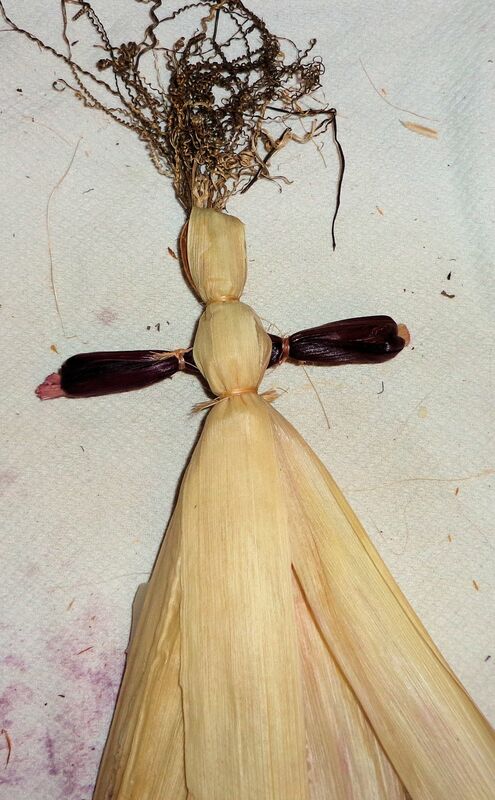 I’ve always wanted to make a corn husk doll. These little figures are traditionally created at harvest time and have a long history in many civilizations including Northern European, Central European and North American native. 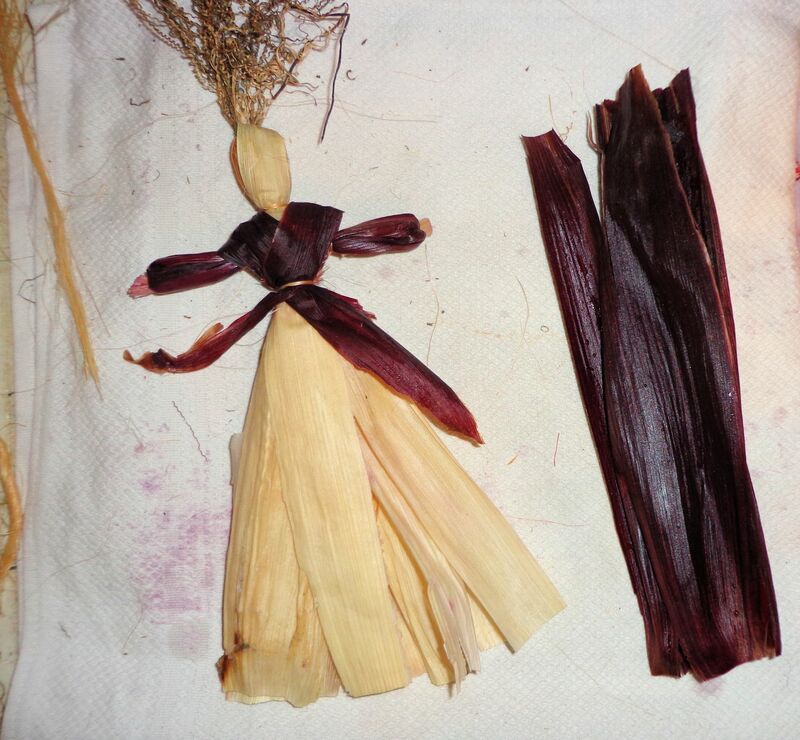 Children often construct crude corn husk dolls. I just think they are sweet and make great decorations. After some serious research online, I gathered enough information to try making a doll. 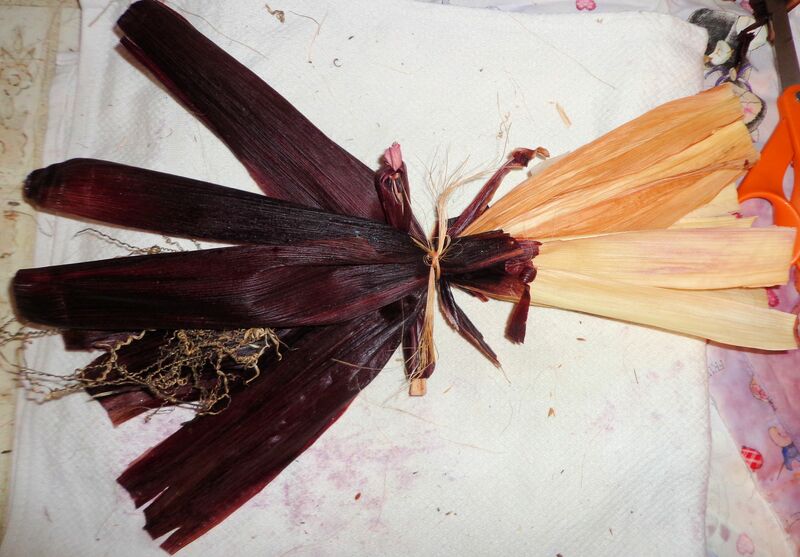 Since I grow indian corn, there are always plenty of husks. 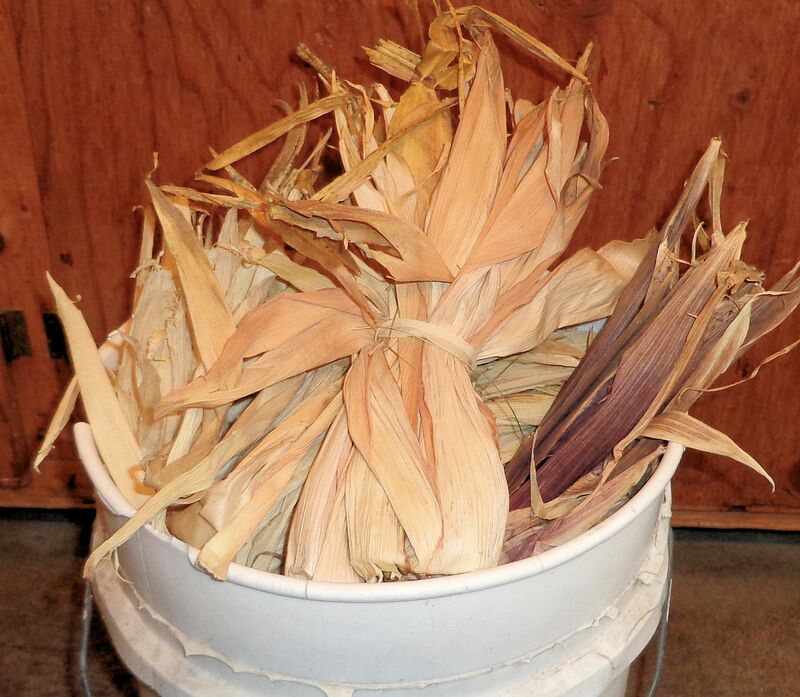 I saved a couple buckets full, both white and red corn husks. The silk would make great doll hair, but I’ve always fed that to the horses. In the future I’ll dry and save that for dollmaking. I found a good supply of tightly curled ringlets of tendrils on the dried squash and gourd vines from last summer. These will make great curly hair for a doll. 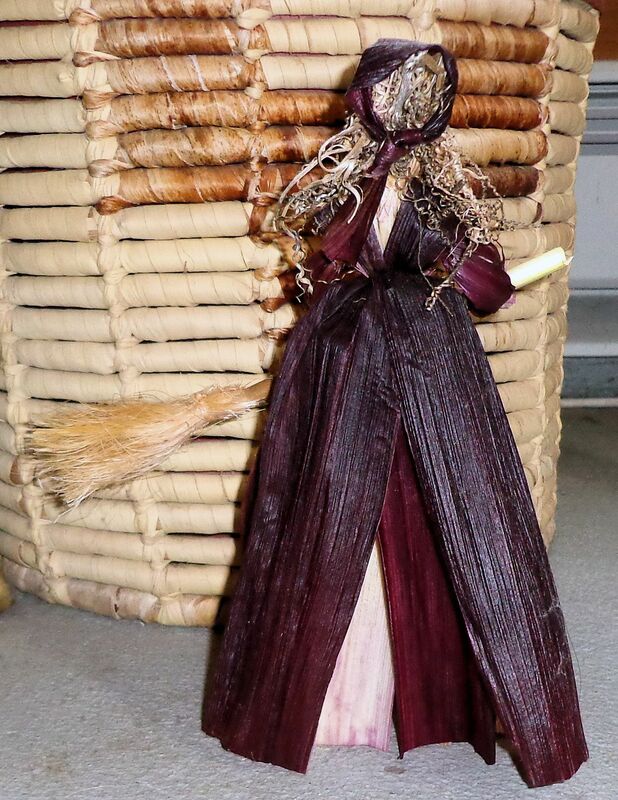 To tie the husks, I’ll use hemp baling twine and I found some thin pieces of corn stalk that can be used to make a broom handle for the doll to hold. 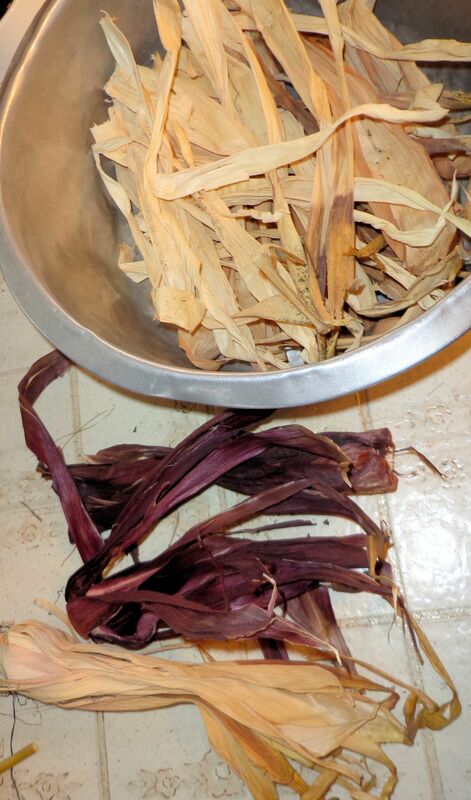 The dried corn husks are soaked for 10-15 minutes in warm water. 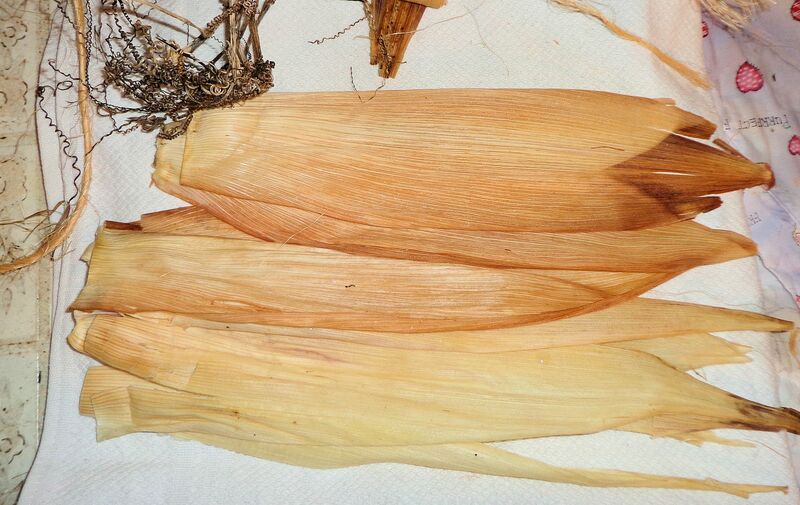 Husks must be dried before use so they will not be too wet and mildew and also not be too brittle and crack. Drying makes the husks tough and soaking them gives a nice pliable material. 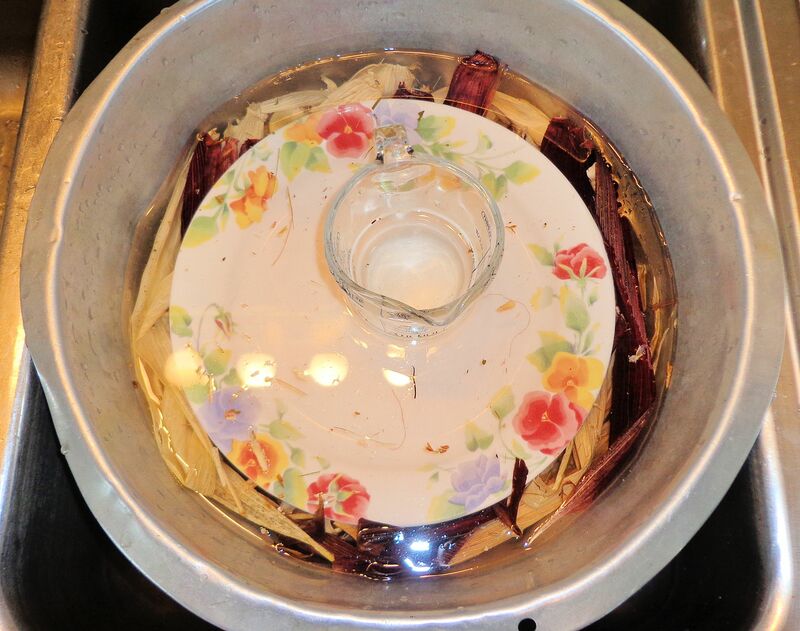 I weighted the husks down with a plate and cup of water because they float. 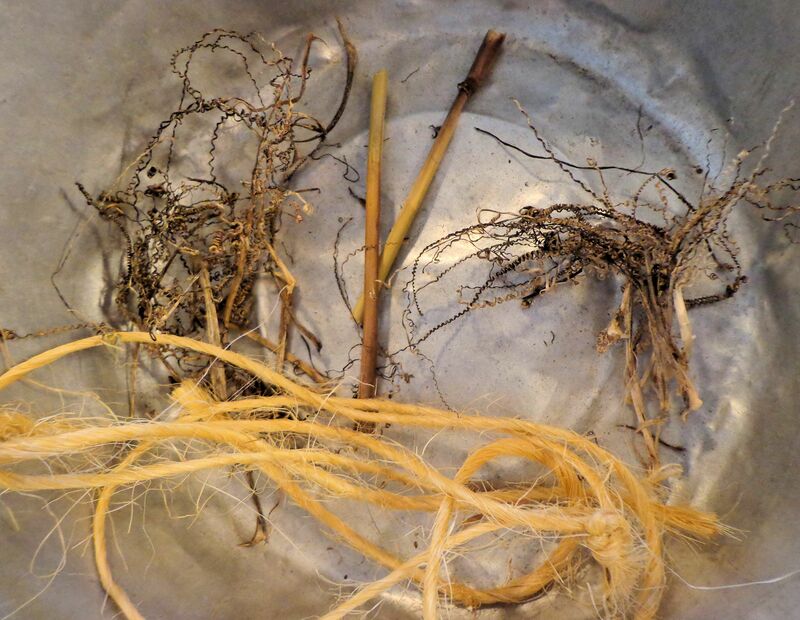 Gathering 8-10 long, full pieces of husk, I blotted them dry, lined up the pointed ends, placed the bundle of gourd tendrils on the inside and tied the end tightly with string. Next, I flipped the stalks around to form the hair and top of the head. 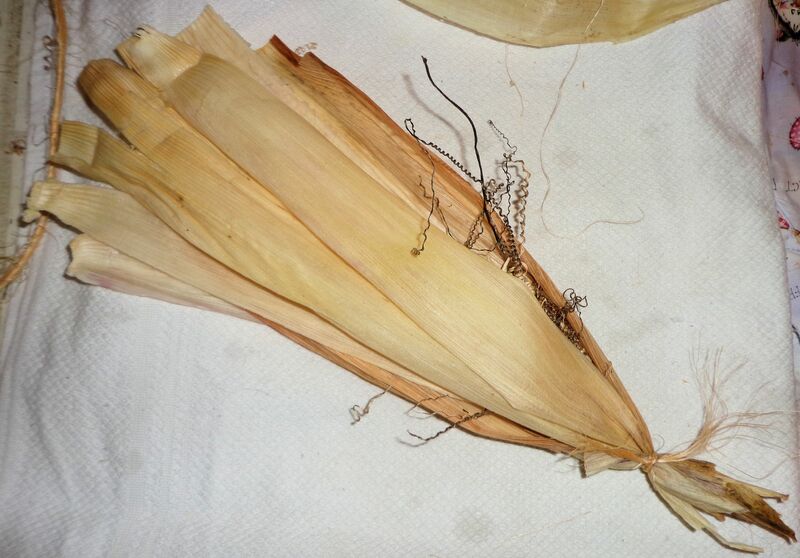 There is enough material inside the bundle of husks to fill out the head. I smoothed the husk in one area to make a nice face and tied the neck tightly. 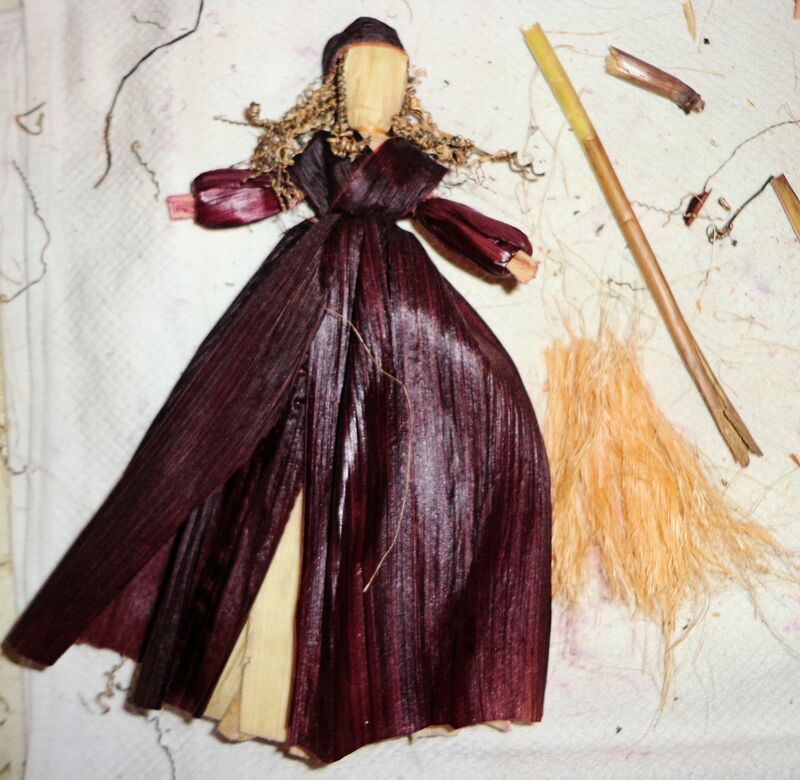 The ends of the husks are cut straight to form the bottom of the doll’s dress. This is her petticoat, a creamy beige color. 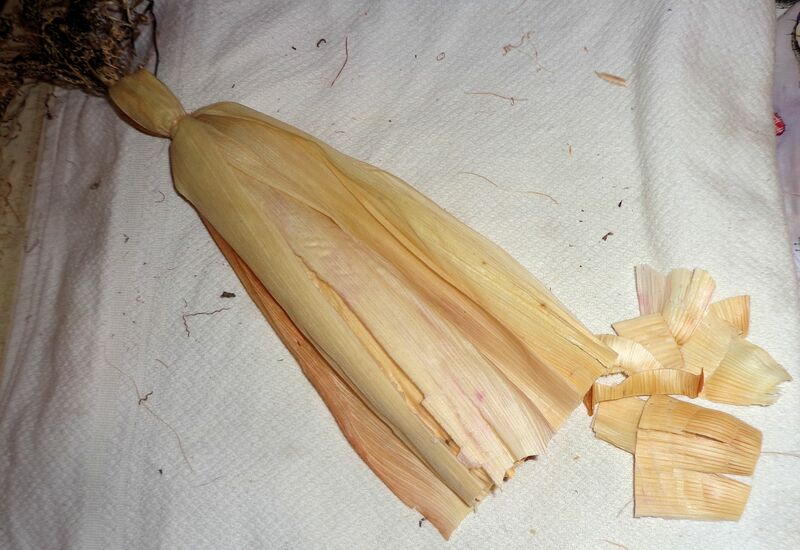 To make the arms, a slim piece of husk is rolled tightly and trimmed to about 6″ long. 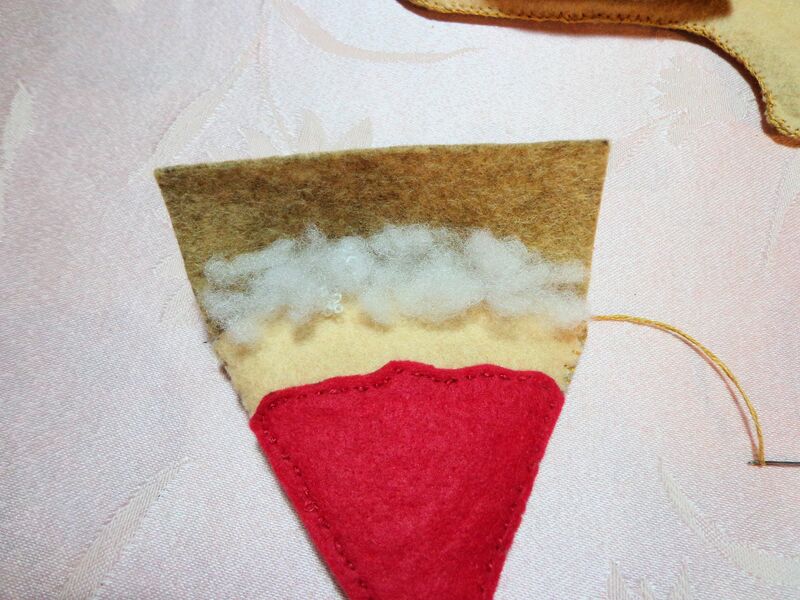 Two pieces of red husk about 5″ square are cut for the sleeves. The red husk is bunched around the end of the rolled piece, about 1/2″ from the end. 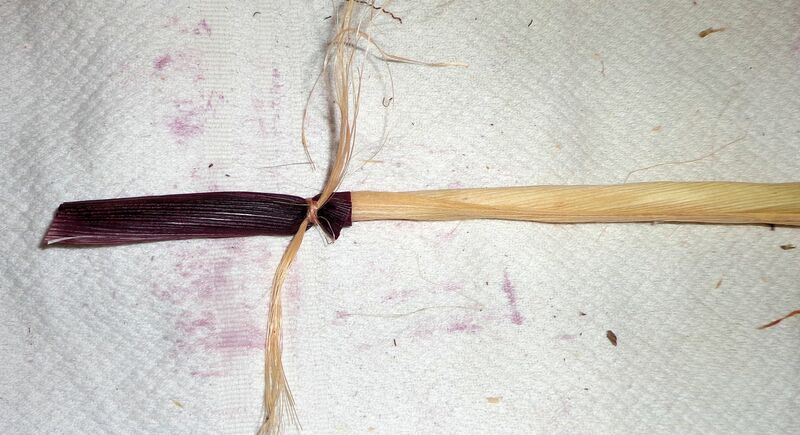 After tying tightly, the red husk is flipped over and the other end tied. This is repeated for the other sleeve. 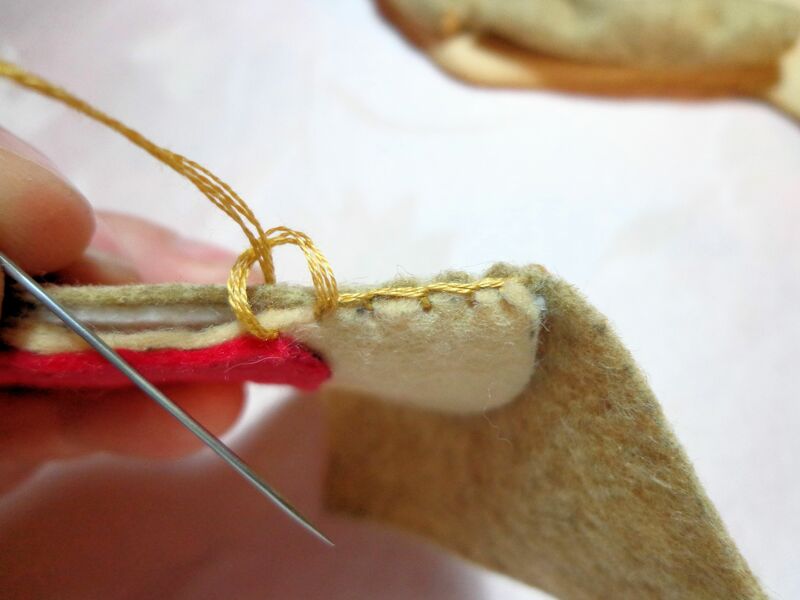 The arm construction is fed up through the bundled husks and the waist is tied tightly to keep the arms in place. Two slim pieces of red husk are crossed over the body to form shoulders and tied tightly at the waist. These strips cover and fill out the arm area. 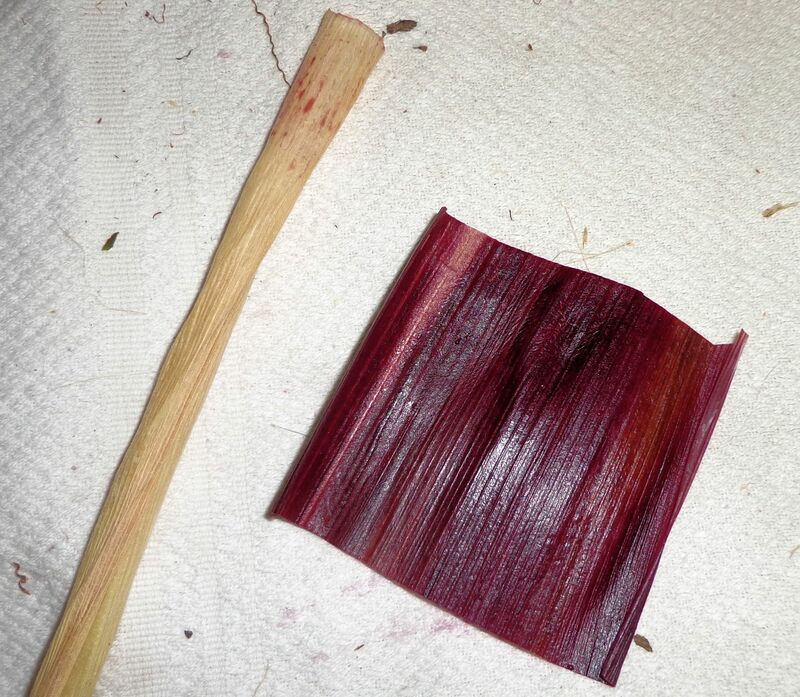 Next, several broad, long red husks are selected for the skirts of the dress. The pointed ends are arranged around the waist, tied tightly, then flipped down. The ends are trimmed again to a straight hem line on the dress. Finally, the hair is pulled down, arranged and I used a slim piece of red husk to make a head scarf since my doll is going to be doing housework. 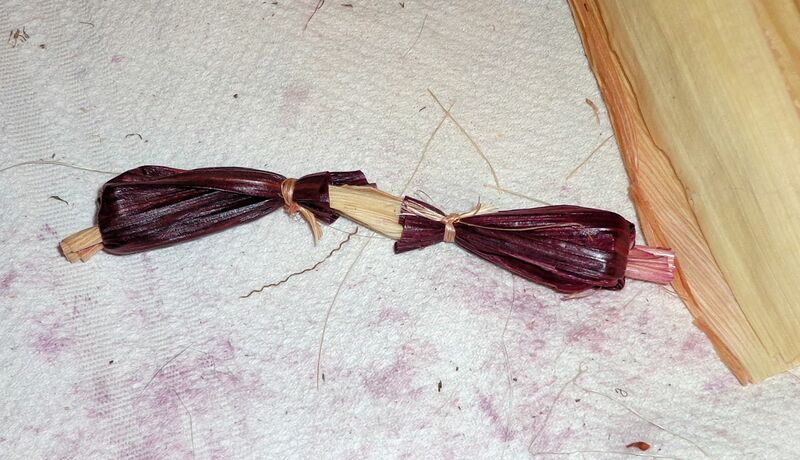 I fashioned a simple broom by tying 3″ long bunches of baling rope around one end of a small corn stalk. To hold the broom in place, one thin strand of hemp twine that is barely visible is tied around the hands and broomstick. 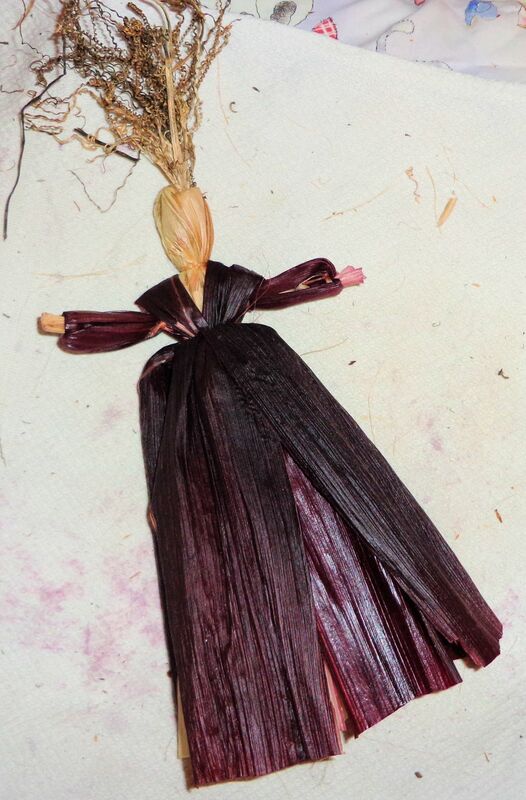 Most corn husk dolls are not given features due to various superstitions from the cultures that originated the dolls. I prefer a simple face so I sketched one with a fine point black Sharpie pen. 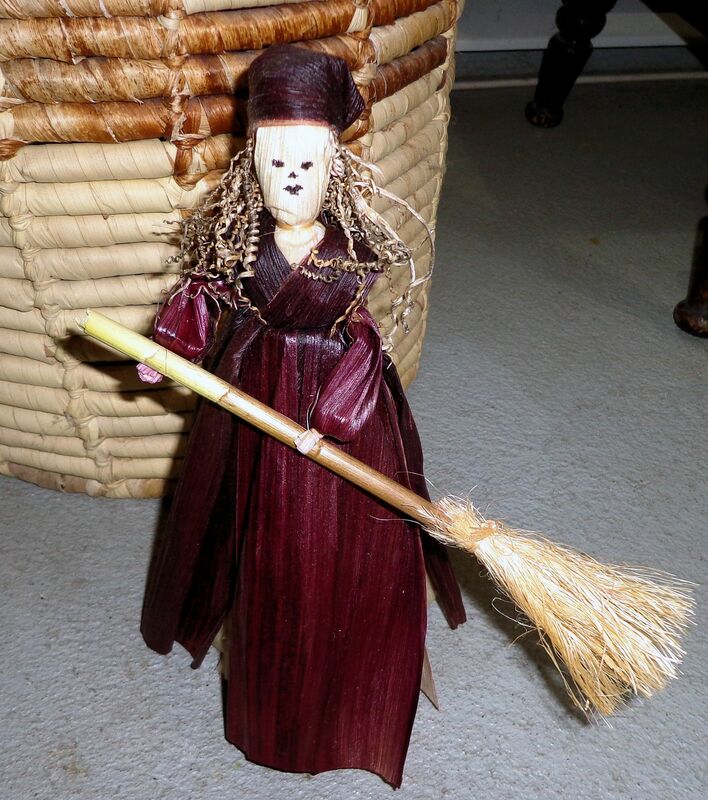 The doll stands 9″ tall and once dried, makes a lovely decoration on a small table in my living room. This was so much fun, I intend to make more. 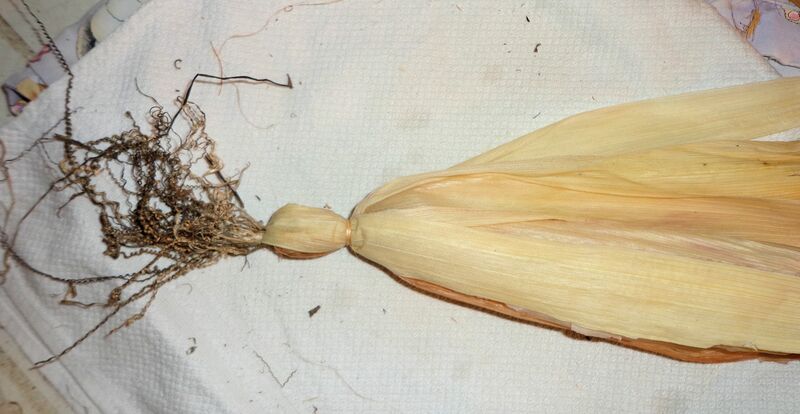 In the future I will use double or triple the number of corn husks for the petticoats and skirts to make them fuller. 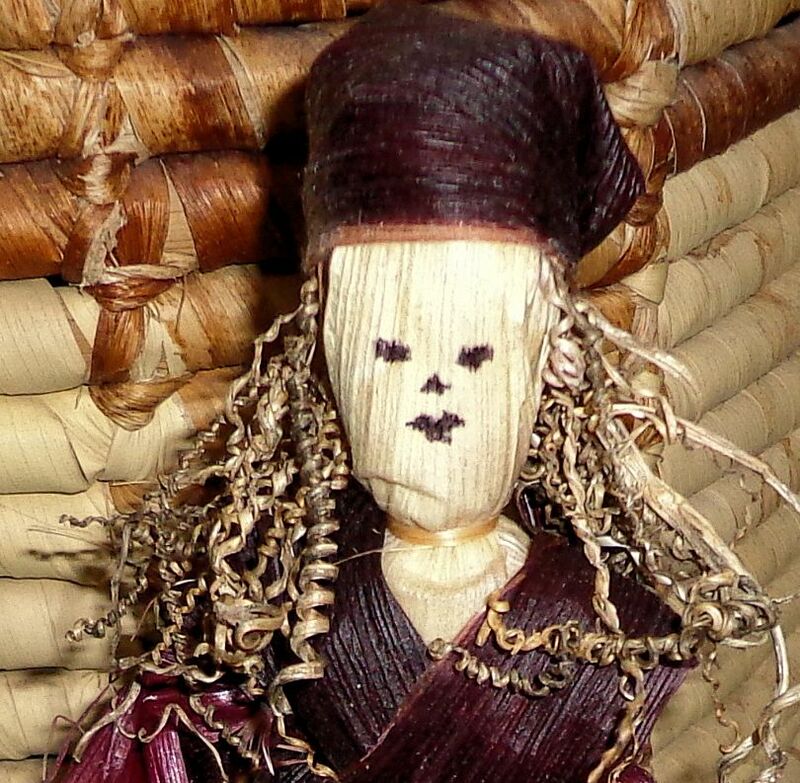 This doll is made entirely from natural materials except for the facial features I drew in with the pen. 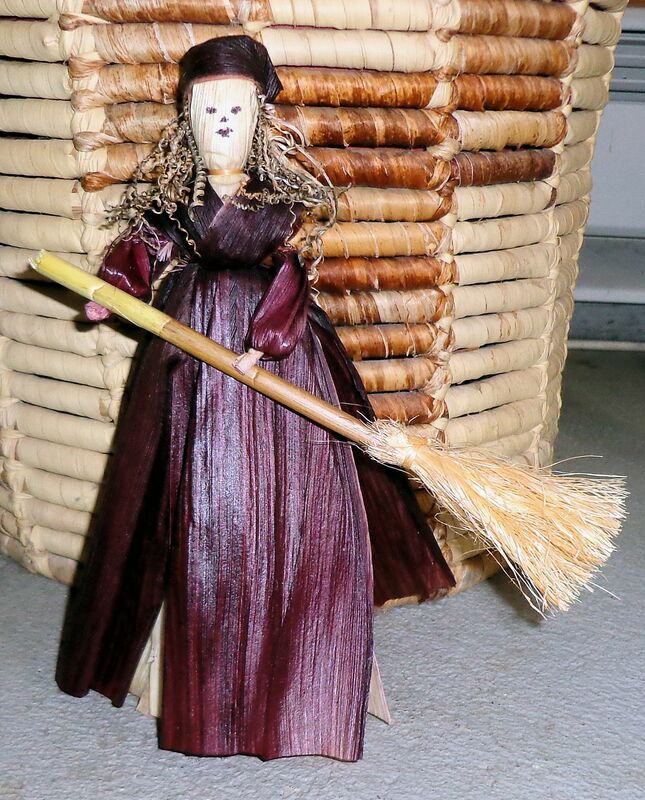 Children adore fashioning these dolls and I think this will be a great activity to do with my granddaughter. The doll does not have to be so elaborate. Often the arms are merely braided lengths of husk tied at the ends. Boy dolls are made by separating the skirts and forming two pant legs tied at the ankles. Sometimes legs are braided to go inside the pants. These would be tied on at the waist before the final layer of husks. I have named my doll Maizie, not original, but apt. The temperature outside is languishing at six below zero F, all is locked in ice and snow, a perfect opportunity to revisit some of the beautiful flowers of summer. 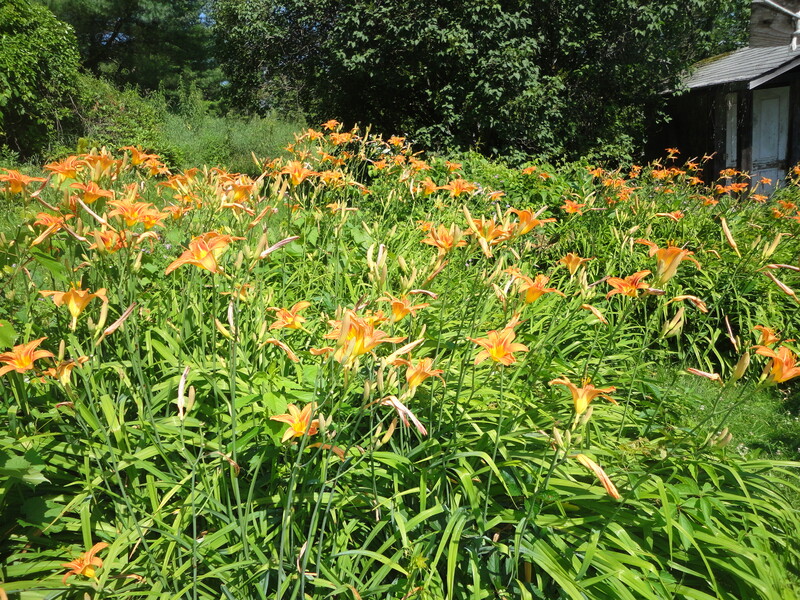 Above, stands of daylilies fill the yard in July. Looking at the photo, I can almost hear the scratchy music of crickets, smell the fresh-cut lawn, and feel the sun blazing through the long daylight hours. 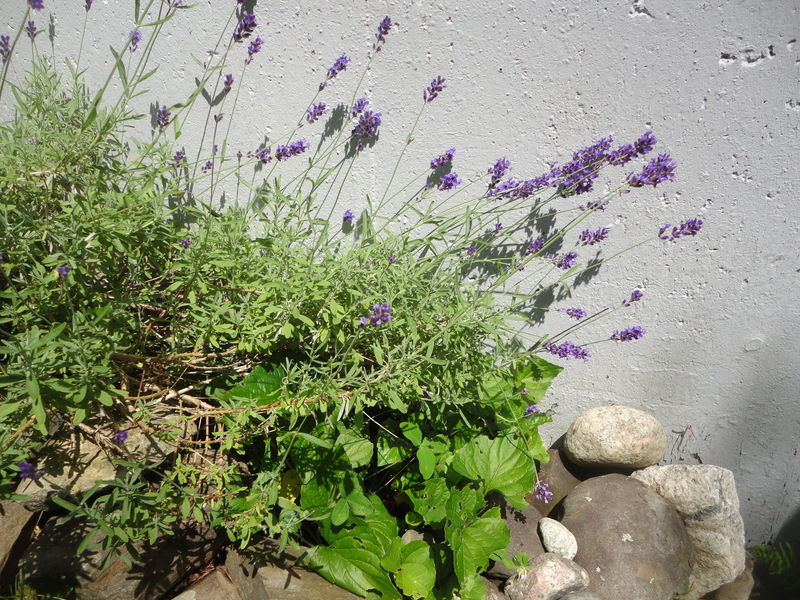 Lavender soaks in the heat against the house wall, while memories of lavender fields in Provence flash through my head. This protected southern spot fools the plant with Mediterranean-like warmth. 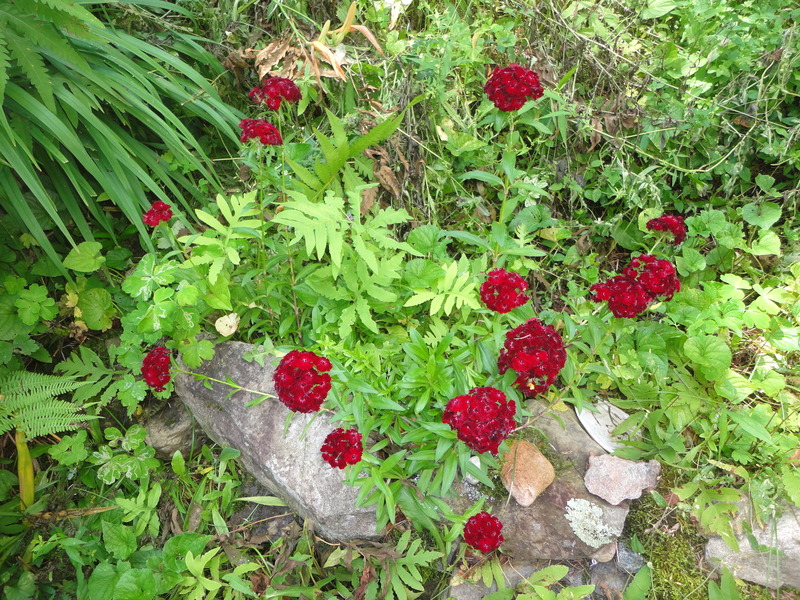 This past year, the Sweet William thrived. What started as one small plant several years ago has spread until Sweet William occupies a solid corner of a rock garden. The long-lasting blooms smell deliciously of nutmeg and cloves. As the blooms fail I allow the seeds to ripen and spread in the area. Butterflies flock to the large flower heads, and hummingbirds dip their beaks searching for nectar. 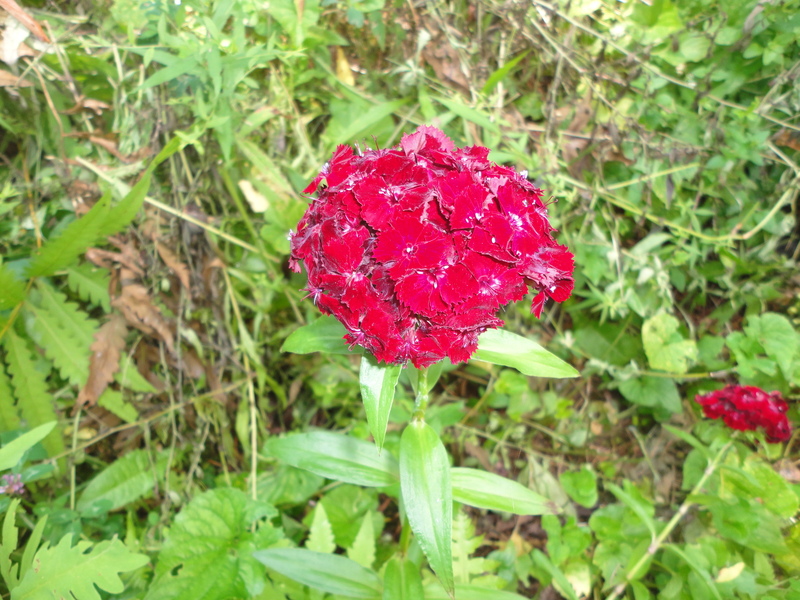 A member of the carnation family, Sweet William is a biennial or weak perennial requiring reseeding to flourish. A native Eastern North American wildflower tamed to garden life, Bee Balm brings a brilliant show in mid-summer. There are several colors, the red being most common and nicknamed Oswego Tea by colonists who turned to the leaves after rejecting British tea in Boston. 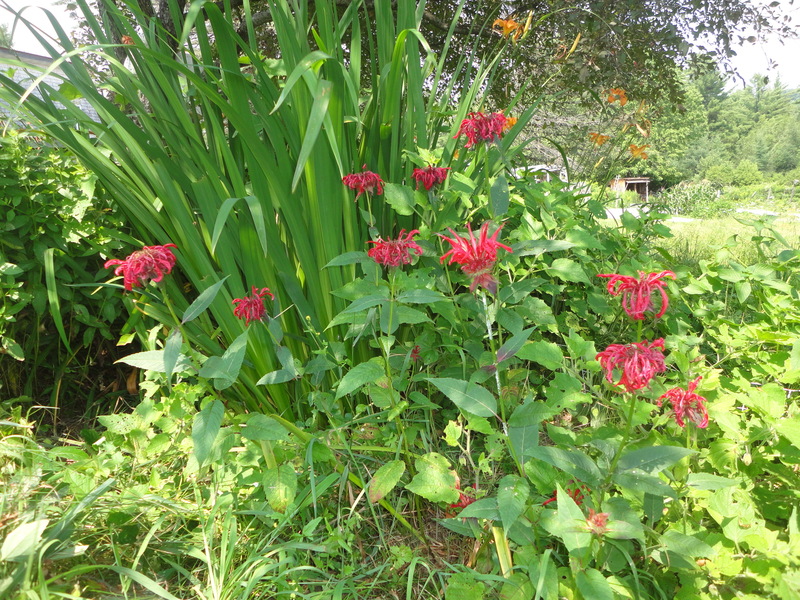 The leaves and blossoms of Bee Balm are used in tea and cooking and sometimes added to fragrant potpourri. As the name suggests, bees and other insects favor this plant. Butterflies and hummingbirds frequent my planting. 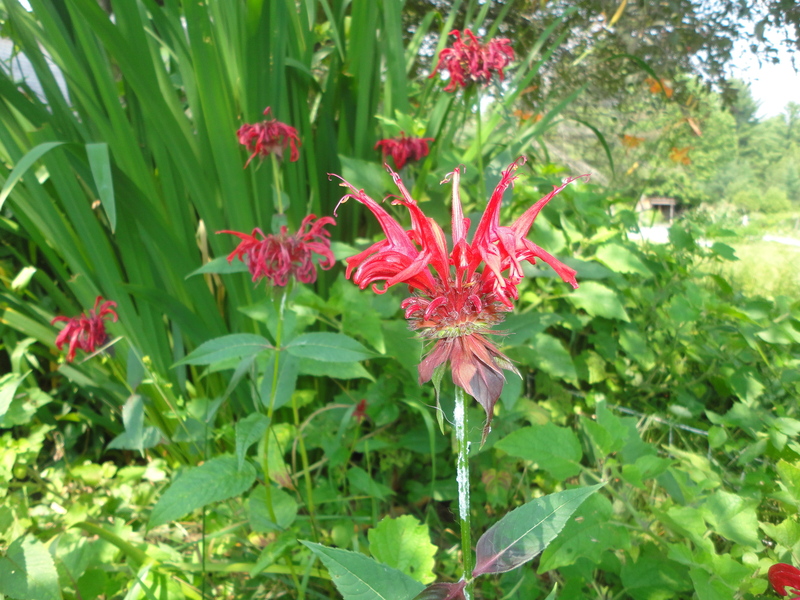 Bee Balm prefers sunny to partial shade areas and can thrive in many soils. Powdery mildew can be a concern for this plant. Some mildew is evident along the stems of my flowers, although it did not seem to bother the plant’s performance. There, I have nearly forgotten the winter chill looking at my garden flowers. Spring, please hurry! A friend gave me this recipe years ago and said it made the best brownies. She was right. I’ve baked these dozens of times and if done correctly, the brownies are irresistible. 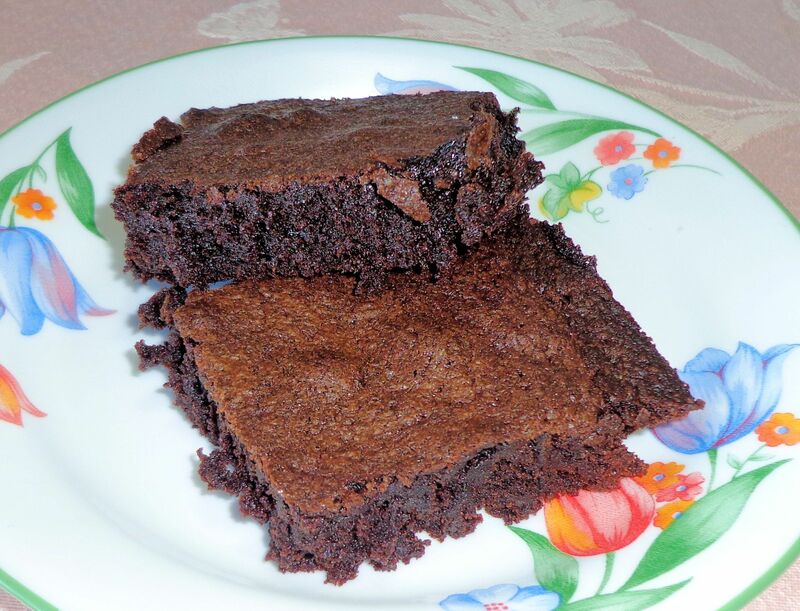 I like brownies to be chewy and moist with a thin, cripsy crust. There are a couple secrets to getting the batch just right. First, use vegetable oil for half of the fat. The oil keeps the brownies moist, especially since this recipe uses powdered cocoa and not melted baker’s squares. The second important element is not over-baking the brownies. They must be removed from the oven while they are still soft. A toothpick test will seem to show the baking isn’t finished. If allowed to stay in the oven even a couple minutes too long, the brownies become cake. The cake is still chocolaty and delicious, great frosted, but not ooey-gooey brownies. Pre-heat oven to 325 degrees. Mix butter, oil and sugar until creamed, beat in eggs and vanilla. Sift together dry ingredients, and beat into the batter until well mixed. Fold in nuts, if desired. Pour into greased 6″x 9″ pan, spread evenly, bake 30 minutes. Remove and cool on a rack before cutting. Usually I double this recipe and bake in a 13″ x 9″ pan for 34 minutes. These are so good when they are still a bit warm from the oven. I like them with a scoop of vanilla ice cream.